Colleges and employers are increasingly relying on social media to assess a candidate's character, integrity, and cultural fit. From Kaplan Test Prep's annual survey of college admission officers to CareerBuilder's survey of employers, it’s clear that social media vetting has gone mainstream. For the most part, students have come to accept this additional hurdle, although many still express fear, uncertainty, and doubt over how their typically one-dimensional social media activities will be interpreted by colleges and employers. In fact, the majority still choose to act defensively by deleting what they perceive to be questionable photos and posts, hiding behind an alias, or shutting down their social media altogether. This is a mistake. Hiding one’s online presence directly conflicts with what is arguably the more important yet largely under-reported aspect of social media: college and corporate recruiters are learning to use the search capabilities of Google, Facebook, Twitter, and LinkedIn to identify and then recruit targeted talent. FastCompany reports that last year 79% of employers reported they’d found candidates through LinkedIn. Twenty-six percent reported finding candidates through Facebook, and 14% through Twitter. Although employers have been embracing “social recruitment” at a more accelerated rate than colleges, almost all colleges have established a robust social media presence and view social media as an important recruitment tool. There is one hard and fast rule related to social recruitment: candidates who do not have a publicly discoverable and keyword-rich social media presence will never be found. Hiding behind an alias or whitewashing an online presence to protect against character vetting definitely eliminates the possibility of being socially recruited. Rather than erasing one’s past, serious candidates must learn how to showcase their skills and credentials while making sure to integrate important character attributes such as leadership. College-bound high school students should note that in 2014 only 8% of graduating high school students had a LinkedIn profile. When it comes to being the target of recruiting, the advantage of that 8% is clear. 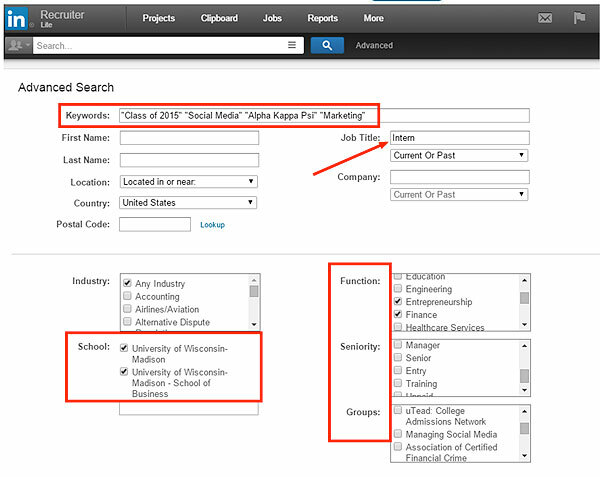 These are the students who were found when colleges searched LinkedIn for talent. What about the other 92%? They are missing out on an important recruitment opportunity. LinkedIn has lowered the minimum age to join to 14, partly in an effort to persuade more students in middle school and high school to begin building their profiles. LinkedIn is much more than job descriptions; it is a place to showcase extracurricular activities, volunteer opportunities, honors, skills, and advanced classes. As more students join, the day might not be that far away when a LinkedIn profile becomes the foundation for a college application or the place where admission officers look to fill the entire freshmen class. Alan Katzman is the founder of Social Assurity, the leading youth social media advisory service. Alan is a former attorney with an expertise in law, technology, compliance, human resources, and investigations. He has lectured extensively on the topic of social media optimization for students and parents, has published numerous articles on the topic, and is considered by the media as a pioneer and an authority on social media for today's youth.